Exile has three new hairstyles out, but you’ll have to visit different locations to get them all. Brianna is a Breast Cancer Awareness (BCA) Fair exclusive style, and Hedy is a TDR exclusive (just these colors), I’m sure they will be released at the main store under regular colors soon. Mina, along with two men’s style is available at Exile’s main store. I’ve been obsessed with new Halloween filters from Picnik, so here’s another one for you guys. I think that my avatar looks way cuter in the ghostly version than normal, sadly, cos normal is so ordinary. 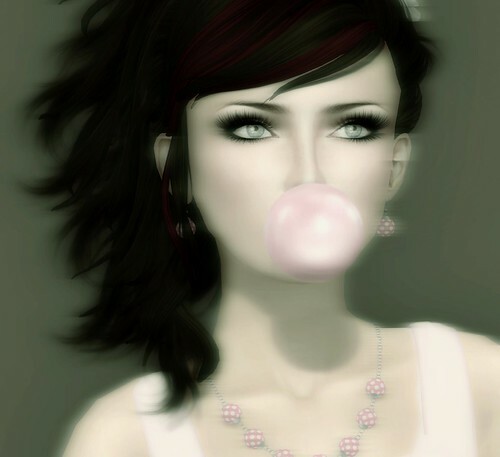 Lol, I was sure you would like that bubblegum! …new mesh and new face animations, ahh. That would be something.